It was 40 years ago this year that South Bank landmark, The National Theatre, was officially opened by Queen Elizabeth II. The National Theatre company had been founded 13 years before (although the concept was first proposed more than 100 years before) and was, until 1976, based at the Old Vic close to Waterloo Station. The new (now Grade II*-listed) premises (which was originally also to house an opera house, although this plan was later dropped) was designed by architects Sir Denys Lasdun and Peter Softly and the structural engineers Flint & Neill. To this day the brutalist design provokes some strong opinions (Prince Charles once described it as “a way of building a nuclear power station in the middle of London without anyone objecting”). It contains three auditoriums: the Olivier (named for acting great Sir Laurence Olivier), the Lyttelton (named for Oliver Lyttelton, Lord Chandos, first chairman of the National Theatre) and the Dorfman (known as the Cottesloe until 2014, it was originally named for Lord Cottesloe, chairman of the South Bank board which oversaw the building of the theatre, before being renamed after businessman and philanthropist Lloyd Dorfman) and were opened progressively between 1976 and 1977. While the first performances began to be held in the Lyttelton theatre from March, the complex was only officially opened by the Queen on 25th October with parts of the building still unfinished. Sir Laurence Olivier gives a speech of welcome in the auditorium which bears his name – it is his only appearance on the complex’s stages. 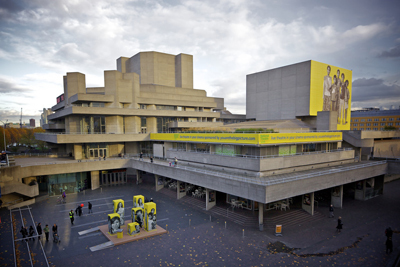 In 1988, the complex was granted the title Royal by the Queen – hence it’s officially the Royal National Theatre – in honour of the company’s 25th birthday. More than 1,000 people now work on the five acre site which as well as the theatres, features rehearsal rooms, workshops where sets and scenes are created and painted and costumes and props are made. Since it was founded, the National Theatre has presented more than 800 productions to an audience numbering well into the millions.